A lot of people have been searching for a book to make sense of the world in the last week, and 1984 by George Orwell has soared up the charts. What people looking for tips may not realise is that things don’t work out so well for the main character, despite the fact that it’s one of the best-known dystopian novels of recent times. 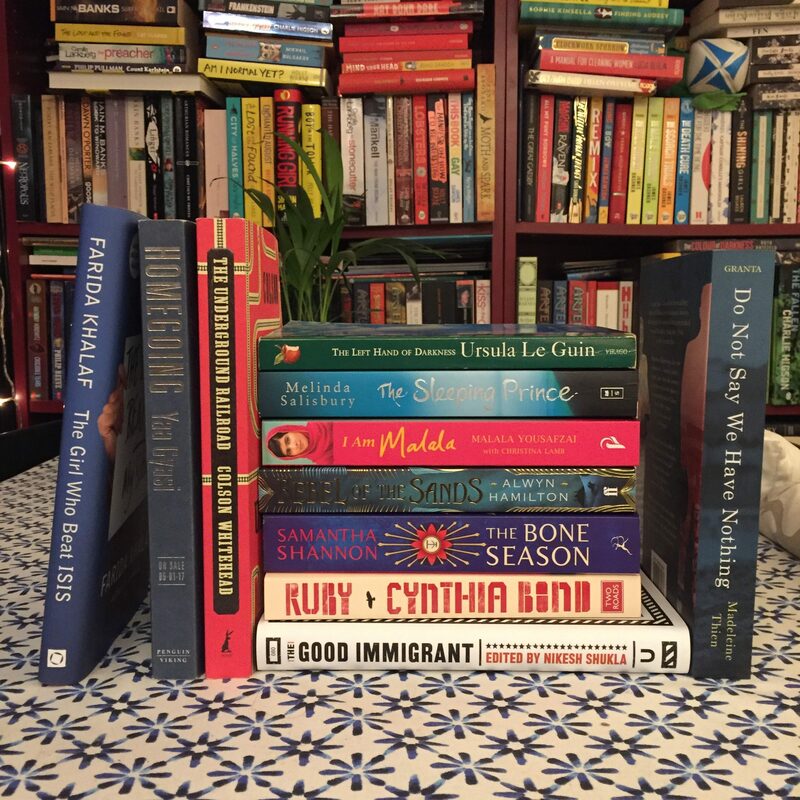 I wanted to recommend some alternative choices from women and writers of colour whose stories will strike a chord and who deserve to be read more widely. This is by no means an exhaustive list, but here are some recommendations of books with something very relevant to say at the moment. The Handmaid’s Tale by Margaret Atwood is set in a fictional reality where women are now either wives or ‘Handmaids’, forced to service men to provide children in a repressive religious state. But, as Atwood has said many times, there’s nothing in the novel which hasn’t happened somewhere in the real world. You’ll have to read it to see if Offred manages not to let the regime grind her down. This is a true classic of dystopian fiction, which deals directly with women’s rights. The Left Hand of Darkness by Ursula Le Guin tells the story of a visitor to a different planet, sent to observe the people who live there, but who becomes a victim of political intrigue and discrimination due to their gender. The envoy is forced to move from country to country, met with distrust, as much a specimen as an observer. This is another speculative classic, exploring the way in which those who are different, particularly from other countries or with other genders or sexualities, are treated. Here I Stand is a collection of stories for teens put together by Amnesty International and published by Walker, with contributions from some of the best writers – new and old – writing in English, including Frances Hardinge, Neil Gaiman, Sabrina Mahfouz, Chibundu Onuzo, AL Kennedy, graphic novel royalty Bryan and Mary Talbot, and Chelsea Manning. The collection is full of brilliant writing, and is also deliberately aimed at highlighting human rights issues. A lot of adults too will find it moving and shocking. As the book’s blurb says, now is the time to take a stand and make a difference. Rebel of the Sands and Traitor to the Throne by Alwyn Hamilton follow the story of Amani, a sharpshooter in the desert town of Dustwalk, as she becomes embroiled with a rebellion against the Sultan whose desire for power is putting her people at risk. Hamilton’s series is fantasy but the world she’s created is based on the Middle East, with its political climate affected by the colonial ambitions of Europe. Amani’s adventures and the variety within the members of the Rebellion she encounters are thrilling and inspiring in even parts. In The Sin Eater’s Daughter, The Sleeping Prince and now The Scarecrow Queen, Melinda Salisbury creates a story which begins with Twylla, the Sin Eater’s daughter, held in the royal castle but not part of the Court, not allowed to be touched in case that person dies, because she is a human method of execution – powerful but disempowered. Salisbury’s books are also all about how Twylla goes about reclaiming herself in the face of great odds, and discovering her heritage. In the world of The Bone Season by Samantha Shannon, those with unusual abilities – the voyants – are forced to hide from a totalitarian regime, Scion, which has been in power since the 1800s. Voyants have been forced underground in order to survive, and Paige, the main character, is part of this fascinating but dangerous underworld in London. Things start to go wrong and she discovers, against her will, that there’s more to the Scion regime that meets the eye. She’s able to use her determined, resourceful nature to help people unite against the forces oppressing her people – voyants and ordinary people alike. Part 2 of the series, The Mime Order, is out now and part 3, The Song Rising, is published in a month. We Should All Be Feminists by Chimamanda Ngozi Adiche is an essay and a rallying call, based on her TedX talk of the same name. She explores how feminism has developed and why we need to be aware and inclusive. It’s also quite a personal essay, which I think makes it harder-hitting and more persuasive – this is essential reading for everyone, whatever your gender. The Good Immigrant, edited by Nikesh Shukla, has had quite a few shout-outs on Adventures With Words but it’s another essential collection. With twenty-one British contributors, the questions addressed are all too familiar for many people around the world: “How does it feel to be constantly regarded as a potential threat, strip-searched at every airport? Or be told that, as an actress, the part you’re most fitted to play is ‘wife of a terrorist’? How does it feel to have words from your native language misused, misappropriated and used aggressively towards you? How does it feel to hear a child of colour say in a classroom that stories can only be about white people? How does it feel to go ‘home’ to India when your home is really London? What is it like to feel you always have to be an ambassador for your race? How does it feel to always tick ‘Other’?” It’s not always a comfortable read, and nor should it be – these pieces rightly challenge the reader to look again at their expectations. In The Girl Who Beat ISIS, a young Yazidi, Farida Khalaf, with assistance from Andrea Hoffman, describes what it was like to have her home destroyed, to be captured by ISIS, and, through sheer determination, to survive and escape. This is an extraordinary memoir, shocking and astonishing, shedding light on the effect on the lives of ordinary people of the conflict in northern Iraq and Syria. I Am Malala may seem an obvious choice, but, if you haven’t read it, it’s really fascinating, and inspirations. Malala Yousafzai and Christine Lamb do a brilliant job of telling the now-wellknown of how Malala refused to back down in the face of the Taliban proscription against education for women, after their invasion of the Swat Valley, which resulted in her near-fatal shooting. She’s the youngest ever winner of the Nobel Peace Prize for her approach to advocating women’s right to education. I love Persepolis, both the book and the film. Marjane Satrapi uses the black-and-white graphic novel form to tell the story first of her childhood in Tehran, as the overthrow of the Shah’s regime and Islamic Revolution coupled with her parents’ political views mean increasing danger, and then her life from 15 until school graduation in Vienna, where she’s been forced to flee due to conditions in Iran. When Marjane returns to Iran in the late 80s, she’s forced to consider whether she can have a future there under the prevailing regime. Satrapi’s observations are equally applicable for any regime where religion and extremely conservative politics become closely linked. Of the books on the Man Booker 2016 shortlist, Do Not Say We Have Nothing by Madeleine Thien was one of my absolute favourites. It’s the stunningly-written story of two families and their interwoven histories over the course of the twentieth century in China, including their involvement in, and rebellion against, the Cultural Revolution and the fallout from it. There’s also the consideration of the way in which emigration allows freedom but also creates isolation from culture and family. What I found most astonishing, when reading, was the way in which Thien describes the policing of speech, words, music and even modes of thought, and how truly chilling I found it. Hear me talking more about it in our Man Booker 2016 podcast. Homegoing by Yaa Gyasi is – I’m sure – going to be one of the most lauded books of 2017. I was given a very early advance ready copy, and I feel extremely lucky to have had a sneak preview of such an extraordinary work. It follows the members of a Gold Coast family, after two sisters Effia and Esi, are split up and face very different lives, one sold into slavery and one the wife of a slave trader. From there we follow their descendants, via missionary schools in Ghana, cotton plantations, mining communities and Harlem bars, as we also follow the development of America itself. Ruby by Cynthia Bond was nominated for the Baileys Women’s Prize for Fiction in 2016. It tells the story of the eponymous Ruby, who has returned to the (ironically named) Liberty, East Texas, apparently a broken women. Gradually, the demons that haunt her – figuratively and literally – are revealed, alongside the prejudice and discrimination faced by black people, especially women. Hear me talk more about it in our Women’s Prize for Fiction 2016 podcast. I found The Underground Railroad by Colson Whitehead a searing, compelling read, and I’ll be astonished if it – and Homegoing – aren’t on the Man Booker 2017 longlist. Whitehead takes the historical figurative railroad and creates a fictional alternative, where the railroad is real, in some places well-kept, in others barely more than a scraped-out tunnel, allowing slaves to escape to northern states and freedom. Unfortunately for Cora, our protagonist, things are not as straightforward as they first seem, as the attitudes and schemes of some of those in supposedly charitable positions are revealed. Whitehead’s speculative mix of fact and fiction is nightmarish and masterful. Those are a few recommendations from me but I’d love to hear your suggestions too – political, feminist, fiction or otherwise. Leave a comment below, tweet us or leave a comment on Facebook with your recommendation. Next PostNext The Scarecrow Queen by Melinda Salisbury – blog tour!